It seems that Juan Carlos Santana, a highly respected strength trainer from Boca Raton, Florida thought it would be a good idea to depth jump off of a plyometric box onto a Swiss Ball. Obviously he suffered injury at the hands of unsafe training methods. Now, we mean absolutely no disrespect to Mr. Santana however we will use his folly to make our point. Why jump off anything? Why use a rubber sphere as a base of support? Why use both of these together to train? We admittedly know very little of this event. However, the details are not our point. Our point is that safety should be #1. If it looks dangerous it probably is… so don’t ask your kids to do it! Straddle barbell on floor, feet about 24" apart. Bend and hold front of bar with right hand palm down, rear of bar with left hand, palm down. Squat until upper thighs are parallel to floor. Keep back nearly vertical, head up. Rise with bar at arms' length until legs are straight, knees locked. Keep bar at arms' length, elbows locked.Do all lifting with thighs and lower back.Return to starting position. Inhale up, exhale down. We think there might be some issues with performing the "Jefferson Lift" explosively! Take a look at The Swiss Ball Plyometric Depth Jumping Experiment. This is a very funny example of the absurdity of many training methods. Keep in mind this website is not related to StrongerAthletes.com and we do not condone these activities. We reported last year about a trainer who had his athletes performing an explosive bench press. 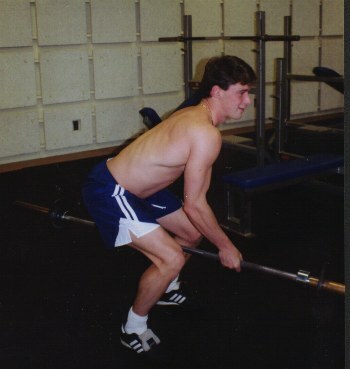 He would actually drop the loaded bar from above the athlete who would catch the bar, lower it to his chest, and then rapidly push the bar up and throw it back to the coach. Wow. So we ask our readers to help us find the craziest, most unsafe movements you have seen done in the weight room. In the meantime we encourage coaches to ask yourself why you are doing each exercise and most importantly, is it safe? Coach Chris Thibaudeau has recently pointed out that our formula for Power that we use on our F.A.Q. is not accurate. He writes, "You use the formula Power = strength x distance/time to prove your point, stating that you can increase power output either by increasing strength or reducing time. Your formula is inaccurate. The real power formula is Power = FORCE x distance/time, similarly you say that Work = strength x distance while it really is FORCE x distance. So doesn't it make a lot more sense to try to accelerate a load rather than lift it slowly? Not trying to be confrontational, but if you are going to utilize biomechanics to prove your theories, at least use proper biomechanics. There are some coaches with no knowledge of the domain that can be fooled to believe something that isn't true." We think Coach Thibaudeau is right on with his remark about coaches with limited knowledge will believe anything even if it is not true. That is the whole purpose of our website. We want to inform coaches who already have too much to do than get degrees in Exercise Science about safer ways to train than what is generally believed. We use the term Strength as opposed to Force for a simple reason. When we first used that formula in an article we were attempting to make a point about the inefficiency of using momentum in developing strength. We wanted to use terminology and research by authors that are highly respected by the Olympic Lifting world. Thus the formula we used, which included Strength as opposed to Force, can be found in "Complete Conditioning For Football," by Michael Arthur and Bryan Bailey from the University of Nebraska. The University of Nebraska is widely recognized as the leading promoter of quick lift training for football. So, despite any other reasoning we may have for using the word Strength, we encourage you to take up your debate with Nebraska not us. Furthermore, Olympic lifting advocates like yourself ignore the fundamental difference between developing and expressing power. To say that lifting slowly with little acceleration will lead to a very low force output does not take into account that towards the end of a working set, the athlete has the intention of lifting the weight rapidly. Lastly, to increase force one must increase strength levels. They are directly related. Strength is the ability of muscle to produce force. If you increase your strength, you increase your ability to produce force. An increase in the ability to produce force results in an increase in athletic power. This is why we write the formula he way we do and the relationship between force and strength is indicated throughout various places in our website. We were pleased to receive the following e-mail. From Jim VanSchoonhoven, a mountain bike coach. About a year ago I started looking in to strength training for my athletes. Of course I kept hearing about the greatness of plyometrics. I almost fell for it. Instead, I kept researching until I found a sensible approach that is safe and effective. I work with Pro riders and most of these kind of guys have done lifting before, and most have never seen any results. Boy do they see results now, and it only takes four or five times of lifting. One of my riders is an observed trails rider. It would be thought of as trick riding on a mountain bike. It takes a lot of explosive power. From right next to your car, he can jump his bike to the top of your car. People that see what he does, can not believe their eyes. At the age of 19 years old this rider is the only 3 time US rider to represent the USA at the UCI World Championships. He also placed the highest ever for an American at the World Championships (16th) , and this is a sport where riders do not peak until they are 28-32 years old. All of this just to say thanks for your web site!!! KEEP UP THE GOOD WORK!!! I believe what you are doing could save 1000's of kids from getting hurt. It was sites like yours that helped point out the stupidity of ballistic lifting and plyometrics. And of course strength training slow and in control manner helped [my son] to develop his explosive power. By the way he was just recently mentioned in an Outside magazine because style of strength training and how much it has helped him. So keep up the good work, I am sure there are a lot of mean, stupid people bad mouthing you and trying to harm your reputations. So make them mad, by spreading the truth. My son and most of my other athletes seem to do better lifting only once every 7 to 10 days. This is in the off season. Sometimes during the season they must lift less, but they still show improvement almost every time they lift. Thank you for the kind words. We are happy you like the website. We really are not far off on frequency though. Our advanced athletes do not train as often either. Our beginners start 3 days per week and reduce from there as they become more intense and learn the movements. We actually decrease our frequency quite a bit in-season. It varies though with the individual athlete. Good luck and hope you have continued success. Please let us know more about how your athletes are doing in the future.